Think about the lighting in your home. You likely have functional lighting as well as accent lighting. You may have the ability to create effects, such as up-lighting key focal points of a room, drawing the eyes upward with track lighting inside architectural areas, or surely the ability to brighten and dim certain lights on command. You can switch a table lamp off to illuminate the room more fully from overhead and above all, you can create appropriate moods using the lighting in your home. Why shouldn’t it be the same way in your outdoor living spaces? Landscape lighting, outdoor stone fireplaces, and fire pits add a lot of ambiance to the home’s natural setting. The lighting effects truly complement the existing plant life and structures—be it a pool, a hot tub, patio area, or a fire circle. Evening entertaining becomes more enjoyable with lights that help to keep the party going while the mood-setting features of the lighting also inspire relaxation and romance for couples after a long day or a busy week. When you move from one part of your home to another, your indoor lighting options certainly allow you to turn on and turn off different lamps and fixtures at your own discretion, rather than keeping them all on or all off at the same time. When you get ready for bed in the evening, you can still have just your bedroom or bathroom light on without lighting up your whole home like a Christmas tree. Similarly, outdoor lighting – if set up properly – can give you the power to set timers to turn your lighting effects on and off according to schedule. It can also allow you to adjust which components are on or off, bright or dim at any given time. 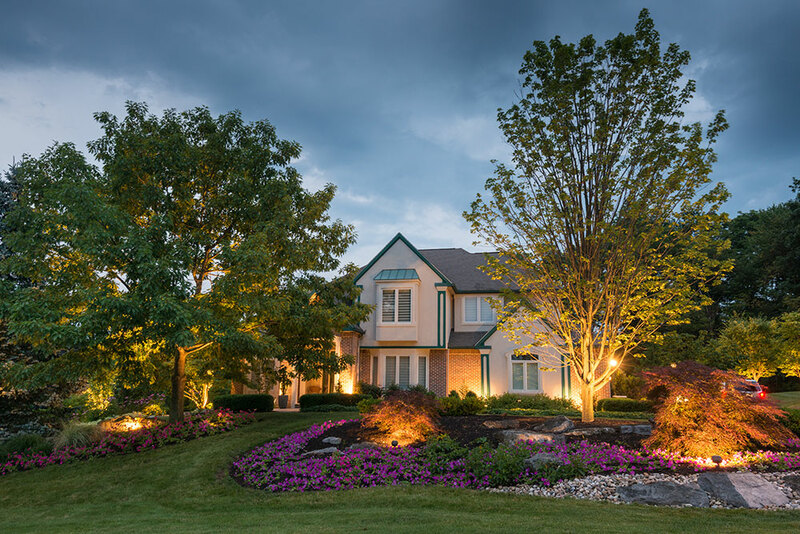 Your landscaping and outdoor areas can respond just as well to varied styles and intensities of illumination, not to mention the ability to turn them on and off individually. Spotlights are just the beginning when it comes to outdoor lighting. Path lights and lighting along the stairs function for safety but also create a gorgeous display of light once the sun goes down. Lighting under the seat wall of a patio emits a lovely social glow. Lights affixed to a tree or the corner of a structure can illuminate the yard or a special outdoor area while a wall sconce can create elegance and a welcoming glow. It’s also possible to create stunning effects with outdoor lighting, such as under-lighting the canopy of a large tree or adding lights to a flowing fountain on your property. One of the most important things to consider when lighting up your yard is the flexibility that exists when you plan your project properly from the start. Work with an experienced landscaper to choose the right electrical options – for example, line voltage or low voltage LED, and so forth. Take advantage of different layers of lighting to create the effects and the functionality you want to achieve. Lighting effects typically mature with the landscaping. Over time, you may have to adjust your lighting and replace bulbs, wiring and fixtures as needed, but if you start your landscaping design with the full vision you hope to pull off, things will go much more smoothly and inexpensively. You and your landscaping company can plan blank conduits for wiring to channel under the sidewalks or patio and other proactive yet noninvasive steps that allow you to make all your outdoor visions come true. Adding a fire element to the home setting always enhances the mood, whether social or romantic. Choose from wood-burning or gas fireplaces and fire pits to give your outdoor setting a fun new flavor – each is different in character, feel, and use. Many times homeowners are not always sure how permanent of a fire feature they want to add to their landscaped areas. It’s easy and affordable enough to start out with a chiminea or a portable fire pit and then build from there once you decide. These fire elements are meant to be temporary, but they allow you to get a feel for having a fire feature outside of your home. Gas-fueled chimineas and fire pits work out to be excellent options for those residences where the local municipality code restricts open flames as they produce a controlled, limited amount of fire that is regulated by gas pressure and the type of burner installed. Meanwhile wood-burning fires grow larger as you add more wood and they can be less controlled. Before installing, you must keep in mind the setting where it will be located (including existing foliage and structures), prevailing winds, the time of year you plan to use it, residential area versus an open field, and so forth. With fireplaces, it helps to have a landscaping contractor who is well in tune with the size and proportions needed to ensure the heat and smoke pour up and out of the chimney rather than billowing out of the face of the fireplace, potentially causing damage to the stone or brick. Beyond the architectural and zoning considerations, you simply need to consider what fits your style and how much of a landscaping element you want your fire feature to be. Decide if you want a major focal point or a small accent and plan accordingly. Making your outdoor living spaces as comfortable and appealing as your interior sometimes just takes a little forethought. Many of these unique yet truly enjoyable elements don’t have to cost more – it just takes some planning and a landscaping company with experience and knowhow.